The UK government is radically cutting support for the disabled. What does that mean for people living with disability? The UK coalition government’s mantra ‘We’re all in this together’ has received considerable attention, echoed and broadcasted by the media since the release of its emergency budget in 2010. This statement is at odds with the ways in which some groups are being penalised by cuts to government funded services and benefits, whilst others are rewarded with tax breaks. The slashing of funding for a range of benefits, tax credits and vital social services and community programmes will hit the most vulnerable – single parents with children, poor working families, ethnic minority groups, young people and disabled people amongst others. The focus here is upon disabled people. 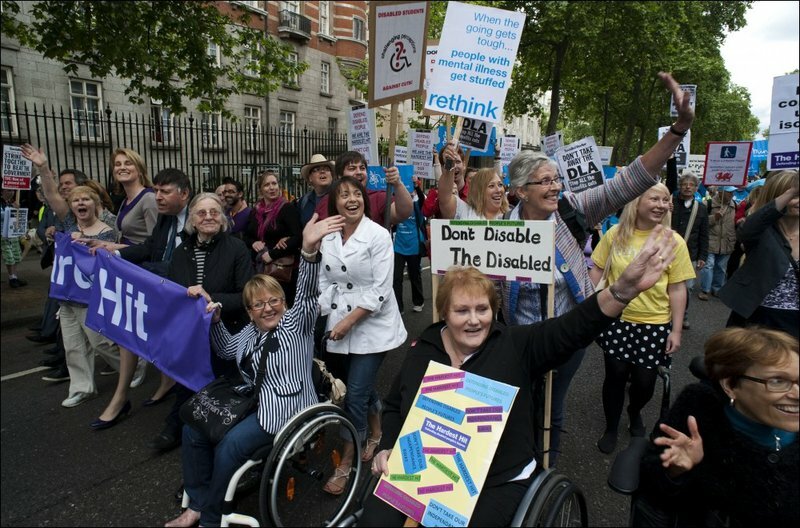 Disabled people have been mobilising across the UK. Supported by trade unions and professional groups, their protests aim to raise public awareness about the severe and harsh government austerity measures and to directly contest the hostile media campaign, which has been growing in intensity over the last few years, regarding the supposedly high level of benefit fraud by disabled people. DPAC and Black Triangle have been leading this campaign, which has been well-supported across the country. So what are disabled people protesting about? In 2011 changes were introduced to the WCA, which is a functional assessment of the ability of a disabled person’s ability to work. In addition to challenging whether the descriptors in this test are fit for purpose when attempting to capture the complexity of the physical, psychological and cognitive abilities of a disabled person, the credibility of the company (ATOS) overseeing the ‘medical assessments’ has also been challenged. For example people undergoing chemotherapy have been pronounced fit for work or have been forced to attend work activity requirements and the test frequently fails those with mental health problems or other fluctuating conditions. Many people who previously were considered ‘disabled’ enough to receive a disability benefit have lost their benefit totally as they no longer are assessed as being ‘disabled’ even though their impairments have not changed. Others have been placed in the work activity group and are forced to attend interviews at the local job centre to prepare them for work as a condition of maintaining benefits. These harsh new measures are not only stigmatising for disabled people, but in fact, ignore the long list of studies that readily identify ongoing employer prejudice as the key barrier to disabled people’s labour market participation. Further, it negates the ongoing impact of the enduring economic recession and the subsequent job losses of ‘real’ full-time, well-paid, stable jobs. The first is the introduction of Personal Independence Payment (PIP) to replace the Disabled Living Allowance (DLA), a non-means tested benefit. The DLA compensated for the additional costs of living with an impairment such as assistance with everyday activities, such as getting dressed, and travel costs. In order to slash at least £2 billion a year from spending on DLA, the new PIP is more stringent - fewer disabled people will qualify, and if they do qualify, the level of financial support will be reduced. The new PIP will further entrench disabled people’s poverty as many disabled people rely on DLA to supplement meagre disability benefits. Being unable to pay for required support within their homes or afford to run a car or pay for taxis in the context of inaccessible public transport, will impact negatively upon the physical and mental wellbeing of disabled people. It is also the case that in introducing PIP the government has deliberately appropriated the language of independent living which came out of the disability movement. However, in reality for many disabled people PIP will mean they remain isolated in their homes. Secondly, in a move that will save at least £1 billion per year the Act limits to one year the length of time that people in the Work Related Activity Group can receive Employment and Support Allowance based on their national insurance contributions. After a year they will have to claim the means-tested version of ESA which, it is estimated, 40 percent of ESA recipients will not be entitled to because, for example, they have modest amounts of savings. At a time when government funding to local authorities has been slashed by up to 40%, disabled people have seen their personal support and care packages radically reduced as local authorities try to make savings wherever they can. Even though a disabled person may be assessed under the Fair Access to Care Services guidelines as in need of services, there may be only enough funding to support those deemed the most severely in need. Ironically, whilst the coalition government has invested considerable time and energy in coercing disabled people into work, one of the most vital areas of support to make this goal possible - workplace supports - has also been targeted as part of the cuts. The Government has reduced the funding allocated for Access to Work - a key program which provides for supports and technology within the workplace to ensure that disabled people can find and remain in decent work. What does the future hold for disabled people? Throughout, the coalition government has claimed that these massive changes to the disability welfare and support system will ensure that the most severely disabled citizens will still get the resources that they need. However, its actions towards most disabled citizens who are losing their disability entitlements reveal its real agenda. The government’s enduring campaign around disability welfare reform has been spread like a virulent plague by the mainstream media, depicting disabled people as lazy, fraudulent and workshy scroungers, as a means to save billions of pounds. The actions of both media and government will no doubt have long lasting adverse effects for disabled people. The Welfare Reform Act (2012), along with the removal of other vital disability supports, will result in diminishing citizenship and human rights of a group of disabled people who are no longer “disabled enough” to qualify for government support. Disabled people are continuing to mobilise, despite, in some instances, being actively denied the right to protest; for example, disabled protesters in London were kettled by police. Despite the Coalition government’s rhetoric, all of these actions beg the question: Are we really all in this together?